I found this awesome online application called FotoJet it helps create social media banners and photo cards for FREE. FotoJet is a free online application that allows users to create collages, photo cards and some social media banners easily from the hundreds of professionally designed templates. Best of all, it requires no installation and registration. 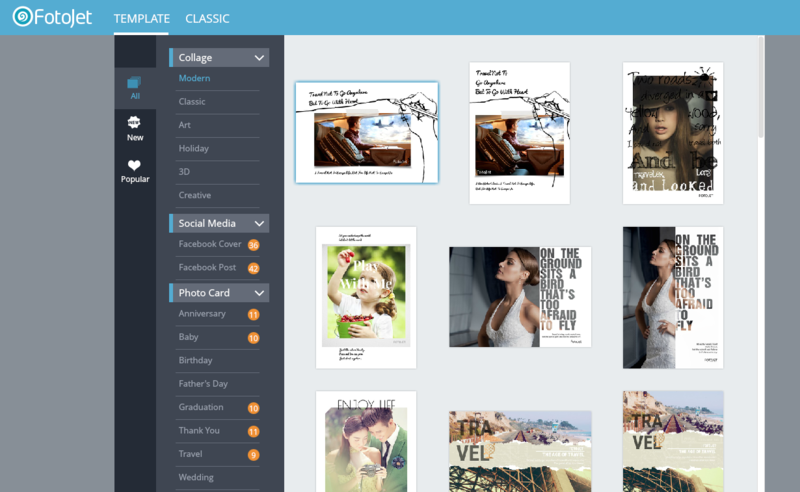 Currently, FotoJet is packed with 320+ templates which were divided into 3 categories – Collage, Photo Card, and Social Media. Besides, those templates cover many themes you want. It just provides a gallery of examples to get all ideas you will think about. Choose the desired one and start to edit. Then, just select the pictures you want from your computer or Facebook albums. Here you can beautify your photos with a lot of features such as rotation, flip, zoom, photo filters, exposure, brightness, contrast, etc. Try these effects and you will finally find the best one that fits exactly what you need. Additionally you can change your text captions’ font, colour, style, size, and so on. Apart from the text font configured on your own computer, there are many fabulous fonts provided by the developer PearlMountain. You are free to use any one you like. The last step is to save and share the artworks you made. It’s very simply to save it on your computer or quickly share it on your Facebook. Choose the way you want. All in all, FotoJet is very easy to use and it’s totally free. If you need to create collages simply and fast, then it is the great choice. It makes photo effects adding and collage creating like a breeze and enables even amateurs to make artworks like a professional.